In the world of dance music, it is rare to find a DJ who exudes the energy of a natural stage performer and is also a musician who produces his own remixes. Since DJ JST (pronounced gist) possesses both of those qualities it is no surprise that he has accomplished so much since the day he embarked on his professional music career in 2004. As a producer his credentials include 19 official productions/remixes, of which several have landed on Billboard's Top 20 Hot Dance Club Play Chart. He was part of the fleet of producers for Erin Hamilton's "Control Yourself" which went to #1 on Billboard Dance/Club play chart and then on to #2 for year end countdown of 2008. His mixes appear on singles for other dance divas such as Lauren Hildebrandt, Jenn Cuneta, Kimberley Locke, Inaya Day, Madison Park, Alyson, Danielle Bollinger, Amber Dirks, Robbyne Kaamil, and Zelma Davis from C&C Music Factory. On the DJ front, he's held a four year residency at 28 Degrees during Sunday Bellini Sunday. He has appeared in Pride events in Boston, Chicago, Rhode Island, and Seattle as well as guest DJ spots in his hometown at Club Café, Machine, Rise (after-hours), Shine, Rumor, Felt, 47 Central, and Randolph Country Club. In addition, his skills took him out of the country to headline the Aquafest Halloween cruise to the Caribbean in 2008. DJ JST is also known for performing with a few extra gadgets. He uses his hand activated sampler to create remixes on the fly and whips out his Zeta Electric violin during stage performances. DJ JST believes in using his music to drive community change, and has volunteered his services for events ranging from Youth Suicide Prevention to HIV research. Most recently he demonstrated his support for marriage equality by doing a remix for Randy Bettis, David James Boyd and Robbyne Kaamil of the song "Free to Love" for www.thepoweronline.org. All proceeds go towards the campaign for equal rights. 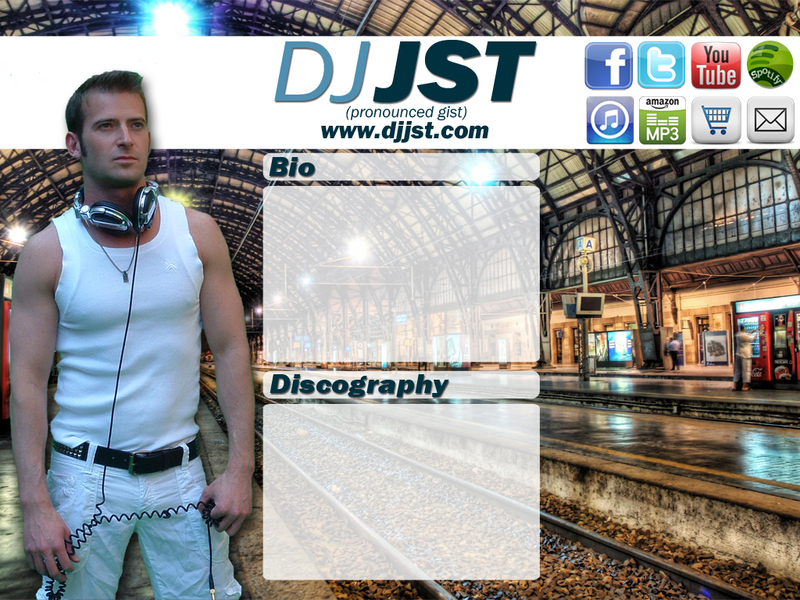 Finally, here are a few other facts about DJ JST. He started violin lessons at age five and went on to tour Europe as Concertmaster of the New England Conservatory Youth Symphony Orchestra in High School. As a kid he was also an athlete who in college went on to compete pommel horse for the University of Michigan's Men's Gymnastics team. At graduation, he was recognized as the first ever varsity student athlete to also obtain a degree in music in the history of the university.